(GBP inc VAT RRP £79). Manage your home accounts successfully with this easy to use program. Produce reports to keep track of payments, standing orders, direct debits etc. So you should never get in debt again! Last and latest UK version. Compatible with Windows XP and via compatibility mode proven to work on Vista and Windows 7. Buy or call us on 0844 808 3699. See other finance software or products from Intuit Quicken. This is the latest and last UK (GBP £ Sterling, VAT and A4 paper compatible) Windows Vista, 7 & 8 compatible edition also know as Quicken 2004 XG Release 2 UK. 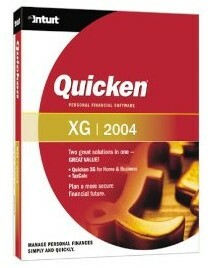 What can Quicken 2004 do for you? With over 22 million users, Quicken is the world's leading personal and home office finance software. Quicken effortlessly manages all your money - making it easy to keep track of your income, expenses, investments, assets and loans. And you can bank online, create budgets, generate reports, figure out your taxes and track your ISAs and other mutual funds. In fact, you can even get masses of helpful information about the best loans, mortgages and investments directly from Motley Fool. Quicken - the smarter way to manage all your personal finances, investments and home office accounts. Easy to use Quicken looks & works exactly like your bank statement - so it's simple to learn & use. It uses no accounting jargon or complex instructions. Quicken takes you through setting up your first accounts. Quicken links with over 90% of bank accounts allowing you to download your finances. Quicken categorises your download transactions and learns from you. Financial Centres give you a fully customisable single screen view of any of the key information that you have defined about your finances. See your financial position at a glance. Understand your entire investment portfolio - at a glance. Analyse and graph market value, price and transaction history of each of your investment funds. Manage your home business Track all your business transactions - payments, receipts, cashflow, customer statements, VAT, estimates and invoicing. Instant access to vital customer information - invoicing, payments, VAT, credit and refunds. This product is available as a download upon request, please order the cheapest shipping version and request a download in the additional information box. The disk will still be shipped to you as a back-up media, but you can have the download for faster access in addition.